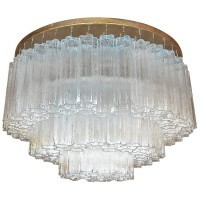 Italian Murano large-scale “Tronchi” glass tube flush mount chandelier. Glass is suspended on beaded brass chains, hanging on custom heavy constructed gold painted metal frame. 14 lights total, each uses 40-watt “A” base bulb, newly wired. A total of four (4) fixtures are available for purchase.